Sometimes a clogged main sewer line (and thus a flooded basement) cannot	be solved using the conventional electronic cabling or	high pressure water jetting to free the clog. In circumstances where your sewer line has completely	collapsed, there is a major shift in the line, or the line has become	so entangled with roots that electronic cabling cannot break through,	you need to dig out and completely replace the main sewer line. In other instances, you’re just tired of a flooded basement and the	costliness that comes with preventative maintenance. Sewer line replacement	is a permanent solution to backups and slow drains. Once we replace your	sewer line, you will never have to think of a backup or flooded basement	again. Lay it and forget it. The process is rather simple: McHenry Sewer & Drain will dig the pipe	out of your yard, replace it with modern PVC piping and cover the trench. While excavated sewer line replacement is permanent, it can be damaging	to your yard and often shapes up to be a large job. It is less costly	than trenchless sewer line replacement and can be performed on any sewer	system, but the total cost of restoring the yard must be taken into account. For example, many people have patios, decks and prized petunias covering	their sewer line. To reach it, these must be dug up. Additionally, the	cost of replacing these enhancements must be taken into account. 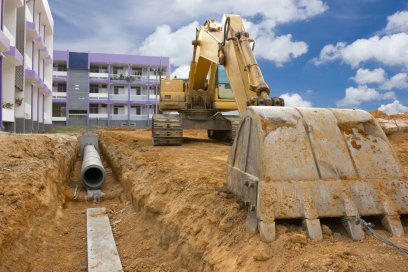 Sometimes excavation and replacement are the only options for a homeowner,	such as with a collapsed, shifted or broken pipe. If your basement floods	often and you would like the peace of mind that comes with a guaranteed	solution, you may want to consider sewer line excavation. We offer a lifetime warranty with this service, so you can rest assured	that your sewer line replacement will last. Call McHenry Sewer & Drain! McHenry Sewer & Drain is large enough to handle any plumbing issues	you may have, including sewer line replacement. We would be delighted	to help solve your problem as quickly, efficiently and cost effectively	as possible. When you call us, we get the job done right the first time.